​A grieving woman is speaking out about the tragic loss of her dog in hopes that it will prevent other pets from suffering the same fate. In an emotional Facebook post, Christina Young from Texas, shared the heartbreaking story of how her dog, Petey Pablo, died after an unfortunate household accident claimed his life. ​On February 19, Young explains that her and her partner, Christian, both headed out to work as normal. But when she kissed her pet goodbye, she had no idea it would be for the last time. 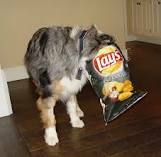 Tragically, while the couple were out, Petey Pablo, found a packet of unopened crisps in the kitchen which became stuck on his snout and caused him to suffocate. “Last Monday, Christian beat me home from work by about 10 min and was surprised when Petey didn’t greet him at the door like usual,” Young wrote. “As he walked in further he saw our sweet boy laying lifeless with a stupid chip bag over his head. He was able to get them off the counter that we will forever blame ourselves for leaving out. 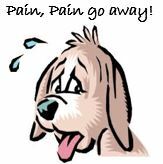 It’s never too late to make a positive impact on your osteoarthritic dog’s state of health. You can empower your dog to live life to the full, as pain-free as possible. Just what is it that causes our dogs to love rolling in stinky bird poo and other types of poo as well? The way in which our dogs love to chew on virtually anything they can find, means that the possibility of choking is increased - make sure you know what to do if this happens.